Many calculus textbooks look to engage students with margin notes, anecdotes, and other devices. But many instructors find these distracting, preferring to captivate their science and engineering students with the beauty of the calculus itself. Taalman and Kohn’s refreshing new textbook is designed to help instructors do just that. 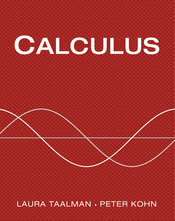 Taalman and Kohn’s Calculus offers a streamlined, structured exposition of calculus that combines the clarity of classic textbooks with a modern perspective on concepts, skills, applications, and theory. Its sleek, uncluttered design eliminates sidebars, historical biographies, and asides to keep students focused on what’s most important—the foundational concepts of calculus that are so important to their future academic and professional careers.